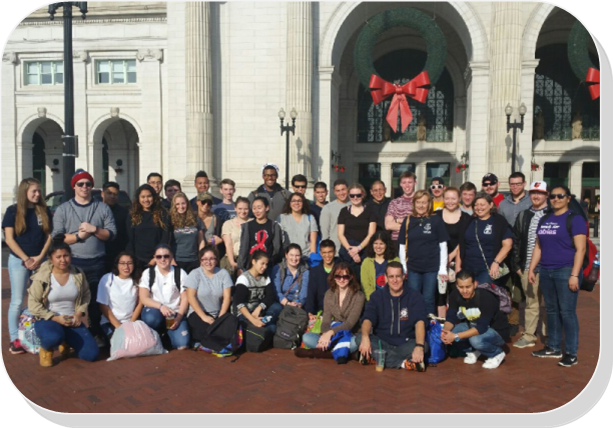 The Falls Church High School Academy's Fire and EMS class spent December 12th in Washington, DC in order to serve the homeless. Penny Kelly, the Fire and EMS teacher, was joined by 45 current and former students. They gave away over 250 toothbrushes away, 75 pairs of socks, food, coats, 25 blankets, 75 pairs of gloves, 25 hats, and multiple reading glasses to over 100 homeless community members. During their time of service in nation’s capital, the students also had a tour of two fire houses: Tower 16 which serves the White House and Squad 3 which serves the capital. This tradition of service by the Fire and EMS class has been going on for 23 years. The Governor’s Falls Church Health Sciences Academy provides expanded options for students’ health science literacy and other critical knowledge, skills, and credentials that will prepare them for high-demand, high wage, and high-skills health sciences careers in Virginia. Photographs & images, on this page, and on this website, are not available for use by other publications, blogs, individuals, websites, or social media sites. For this and other business stories on Annandale see the ENDEAVOR News Magazine.